The humble backseam has been reinvented so many times it is difficult to imagine how a designer might do it with originality once again. But Designers like Wolford put our fears to rest with each new fashion season that passes, as they always impress us with how they do exactly this. This backseam is a perfect example of how beautiful and innovative they can be. A simple row of pearls has made this backseam one of the most stunning items of the year and completely reinvented the traditional motif to be something new and never before seen. But that is not all. 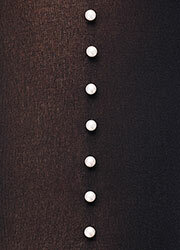 These pearls are real, all 70 of them, making this one of the most luxurious fashion tights of the year too.